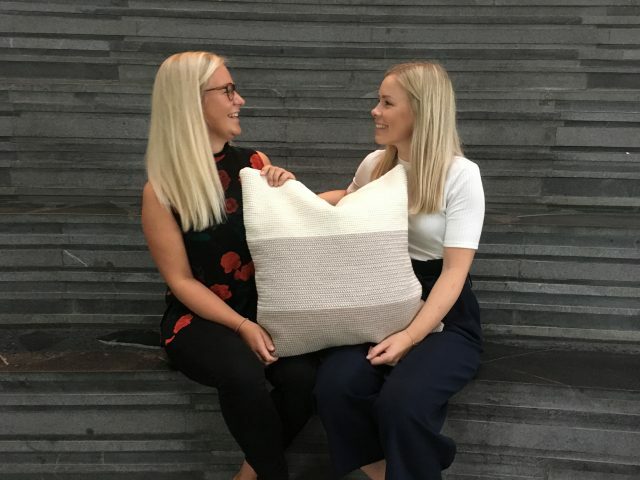 Pillow by pillow, Novaheim wants to get female asylum seekers more in tune with the Danish job market, give them a better understanding of Danish culture in general, and change the discourse revolving around asylum seekers. All through the use of yarn and crocheting needles. “My home is filled with crocheted pillows and I search for new crocheting patterns almost every day. 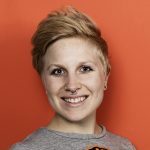 I can’t help it,” says Emilie Bruun Poulsen, who studies a master in business administration and organizational communication at CBS and is the other half in the CBS start-up Novaheim. CBS WIRE will follow Novaheim during their process of starting up their company with 20 female asylum seekers from Avnstrup Asylcenter this autumn. 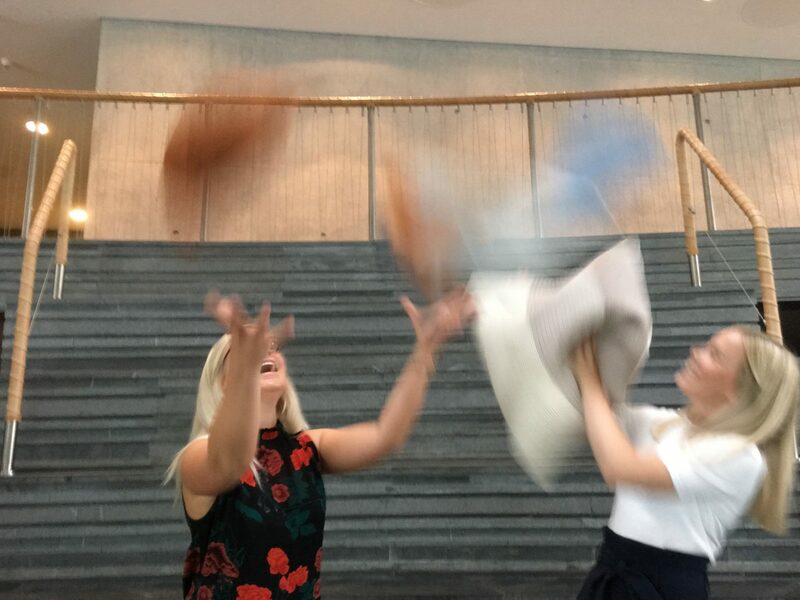 We will pay a visit to Avnstrup Ayslcenter and see how it goes with the production of pillows and dishcloths for the web shop and talk to Emilie Bruun Poulsen and Marie-Louise Reade Lomholt about the ups and downs. Emilie Bruun Poulsen has been crocheting for a long time. Mostly, using it as a way to relax. But after a semester abroad in Milan in 2016, crocheting became the foundation for a business idea. In Milan, Emilie Bruun Poulsen presented and won an entrepreneurship competition for her idea involving doing creative crochet workshops with female asylum seekers, selling the home accessories they hand make and then financing social activities outside the asylum centers for the group involved. This, in turn, would give the asylum seekers a better chance to enter the job market later on. Now, Emilie Bruun Poulsen and her co-partner Marie-Louise Reade Lomholt are launching their socioeconomic company Novaheim and will start working with about 20 female asylum seekers at Avnstrup Asylcenter this autumn. The word ‘novaheim’ means new home in the art language called Esperanto. The language was launched in 1887 to give people with different mother tongues a way to communicate with each other. 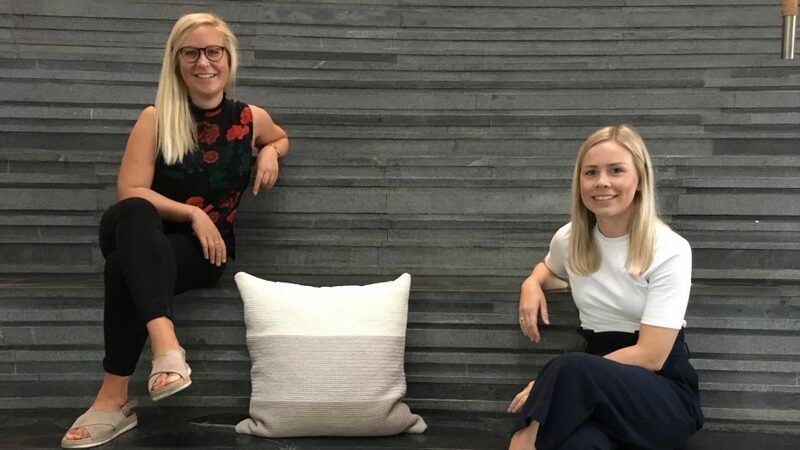 Emilie Bruun Poulsen and Marie-Louise Reade Lomholt have spent DKK 20,000 from their own money to start up the company. Mostly to buy materials such as yarn and crocheting needles. Novaheim got sponsored by the Danish company Kvadrat who gave the back pieces for the prototype pillow. Novaheim only uses yarn and pillows made from recycled and organic materials. “It doesn’t make sense to have a socioeconomic company if it isn’t sustainable as well. Right now, we are spending resources worth of 1,7 Earths, which seems insane when we have only got one,” says Emilie Bruun Poulsen. “Only 11 percent of the female asylum seekers who get residence permits have a job after three years. These women come from countries with different working cultures than the ones in Denmark. We wish to give the women insights into the Danish working culture and prepare them for the expectations and responsibilities which exist there,” she says. After Emilie Bruun Poulsen won the competition in Milan, one of her teachers encouraged her to move on with the idea. She then contacted her childhood friend Marie-Louise Reade Lomholt, who studies a master in Management of Creative Business Processes at CBS, and asked if she wanted to be part of the project. Luckily, she said yes, although she couldn’t crochet herself. “Emilie has taught me everything about crocheting, and I can tell you, it isn’t just some grandmother thing. There are actually some beautiful things that we can produce,” says Marie-Louise Reade Lomholt. 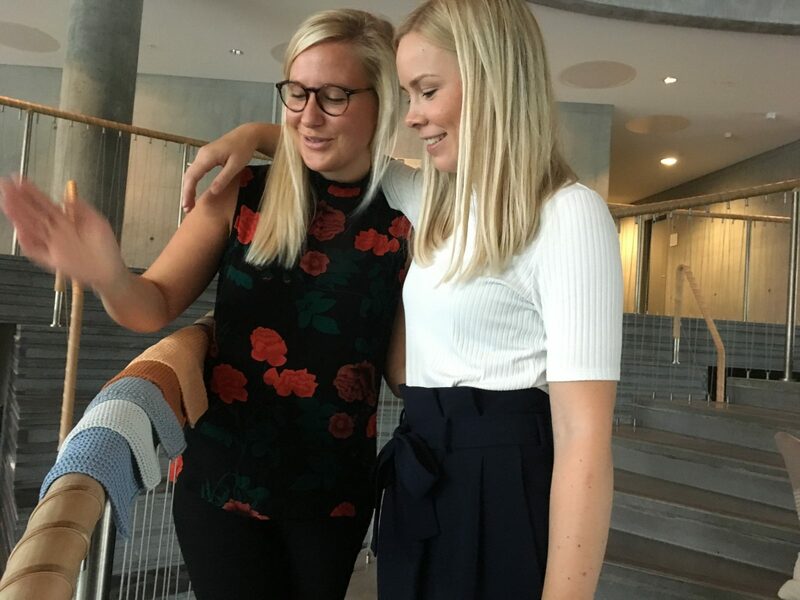 Emilie Bruun Poulsen and Marie-Louise Reade Lomholt applied to be a part of Copenhagen School of Entrepreneurship at CBS in order to get the company properly started. “Being part of CSE has meant everything to Novaheim. I was actually way more nervous about the meetings at CSE and whether they would take Novaheim from Proof of Concept to Proof of Business where you can get much more help, than going to defend my bachelor’s exam,” says Emilie Bruun Poulsen. To see whether Emilie Bruun Poulsen and Marie-Louise Reade Lomholt’s idea would work in practice, they contacted Red Cross and made an arrangement with seven women from Esbønderup Asylcenter in Northern Zealand who were invited to be part of the project for three months from March to May this year. “We thought we were well prepared. We weren’t,” says Emilie Bruun Poulsen and smiles. 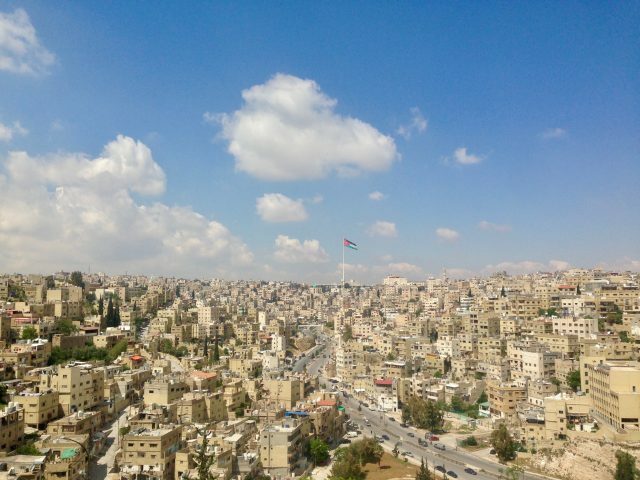 “We had translated the entire plan and project into Arabic, only to discover that only one of the seven women spoke Arabic and many of them couldn’t speak much English or even read. This made communication limited, but we managed to show them the technique and off they were,” says Emilie Bruun Poulsen. According to Novaheim a lot of research into knitting and crocething points out that it is a good way to deal with stress. The repetitive movements of the fingers and eyes have a soothing effect on the body and mind. “I crochet each week. It calms me down and it’s a way for me to plug out. And then it’s so satisfying to see the end result. Finding new crochet patterns makes me so happy,” says Emilie Bruun Poulsen. The seven women on the pilot project were really enthusiastic about crocheting and it came as a surprise to Marie-Louise Reade Lomholt and Emilie Bruun Poulsen that they were so eager to take part in the work shop. “In a matter of a few weeks, we ran out of yarn. The women were so fast and eager to crochet the dishcloths and pillows. We couldn’t keep up. One of the women told us that her husband had found her crocheting in the bathroom at four in the morning because she couldn’t sleep,” says Emilie Bruun Poulsen. Marie-Louise Reade Lomholt and Emilie Bruun Poulsen explain that the female asylum seekers are an interesting group to work with, as some of them come from cultures where it is expected that women spend much of the day at home taking care of the house and kids. In Denmark, it’s different. It’s normal for women to work, and that might be overwhelming for someone who doesn’t know what to work with. But Emilie Bruun Poulsen points out that many of these women have some magnificent hand-working skills in terms of sewing, knitting or crocheting and that is a good starting point. “By giving the women this opportunity we try to start the integration process at the asylum center and they are much more prepared to engage with society when they get their residence permit,” says Emilie Bruun Poulsen. “Spending more and more time with them, they started to open up. With the help of interpreters at Esbønderup, we talked about different things, like, how it’s normal that Danish women don’t marry at an early age. So, they also got insights into how the Danish society works,” she says. Emilie Bruun Poulsen and Marie-Louise Reade Lomholt talked to the women and agreed that parts of the profit from the sales will be used on social activities outside Esbønderup. Like paying a visit to Egeskov Slot. “Novaheim really wants to be a part of changing the discourse revolving around asylum seekers as being bad guys or victims. They are humans like you and me with stories to tell and competencies to share with the rest of us,” says Marie-Louise Reade Lomholt. Novaheim doesn’t sell any pillows or dishcloths yet, but will do so later this autumn. And when buying a pillow, you get a short story about the women who’ve made it. “Hopefully, this project can provide a mutual understanding between the people who request asylum in Denmark and the Danes,” says Marie-Louise Reade Lomholt. The next project was supposed to start off at Dianalund on the 4th of September, but the plans were changed all of a sudden. Novaheim got a call from Dianalund who informed them that it was going to be closed down immediately and that all of the residents will be moving to Avnstrup Asylcenter just outside Roskilde. What to begin with looked like a bad thing, actually ended up turning out for the better. “There are 650 people at Avnstrup, which means we will have the opportunity to offer more women a chance to be part of Novaheim. So, that’s a good thing,” says Marie-Louise Reade Lomholt. Novaheim will start up at Avnstrup on Tuesday the 12th of September and expects to have a few volunteers who can help out by teaching the women about techniques and patterns. 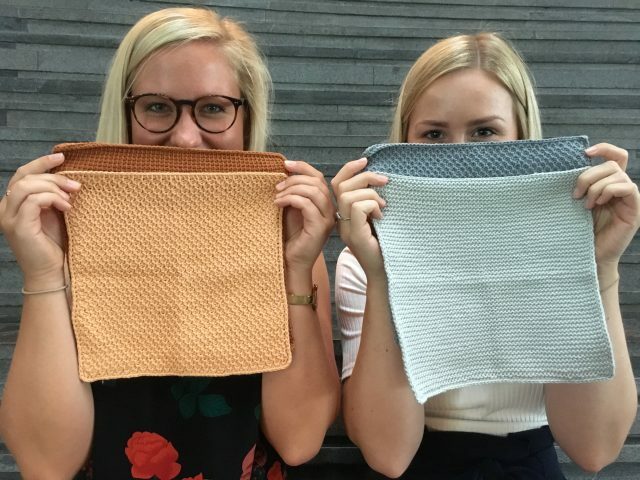 Emilie Bruun Poulsen and Marie-Louise Reade Lomholt have also made a Youtube-channel with videos on how to get started and what to do if the crocheting needles aren’t doing as told. “I’m just so excited to meet these new women, get to know them and see what beautiful thing they can make and then, of course, get the things out there and tell their stories,” says Marie-Louise Reade Lomholt when asked what she looks forward to the most. Marie-Louise Reade Lomholt is currently doing an internship at Novaheim, devoting all her time to the company. Before they both had to find time to study, work at part time jobs, Novaheim, boyfriends, friends, and family. “It was pretty tough to get the internship at Novaheim settled with CBS, but it frees up so much time for the both of us. I’m just glad we are a team. I wouldn’t be able to do this on my own,” says Marie-Louise Reade Lomholt. So far, the plan is to start out with dishcloths. In October, the women will be introduced to pillows and by November, Novaheim expects to open up a web shop for Christmas sales. And they are much more prepared this time. “We have bought much more yarn this time. But I kind of foresee that we’ll get surprised about how quick they use it,” says Emilie Bruun Poulsen. Really good initiative and even more a great reporting.